"A big thank you!" "Our team is very excited... It's fantastic!" 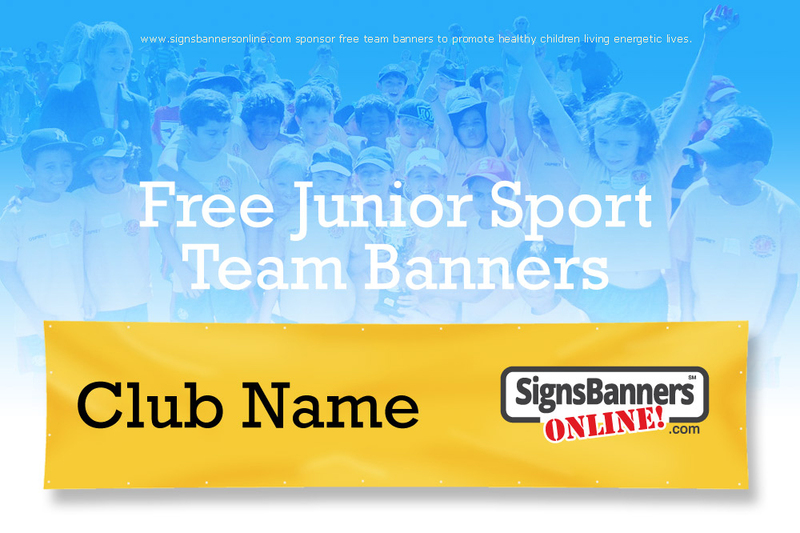 SignsBannersOnline.com sponsor junior sporting teams and free team banners for participation to promote healthy children living energetic lives. 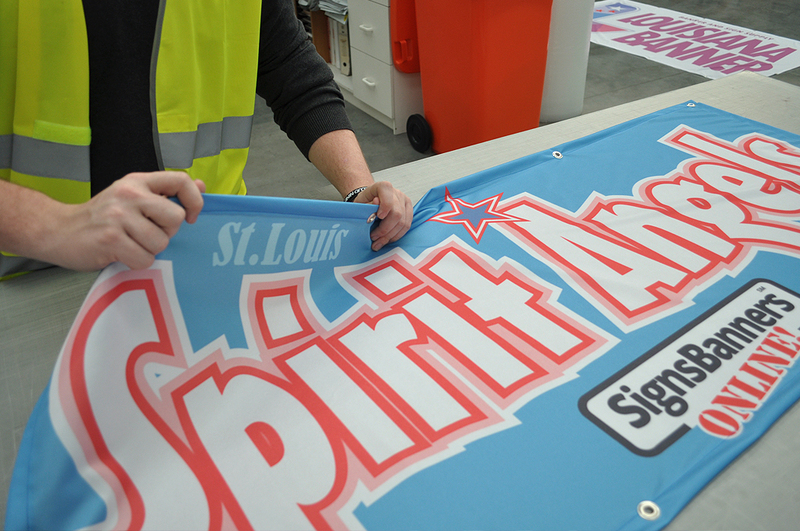 We will give you a new printed banner with your team's emblem FREE! 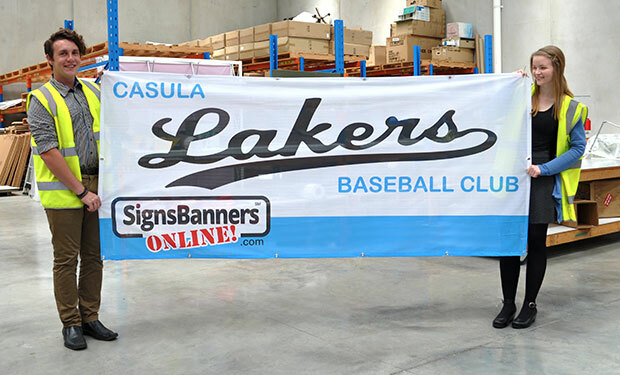 We are proud to supply ALL America with free team banners so if you have a club or team or special group you motivate let us know. LAYOUT DESIGN: 2/3 is your area... 1/3 we place our logo. NON POLITICAL: We do not promote political messages. EQUAL OPPORTUNITY: We are equal opportunity for children of all abilities. SUITABILITY: Offer may be rejected at our sole discretion. "Free - No Payment is required"
We will print, sew, grommet and ship out the printed banner for you. No payment is due. However, if your local government laws require taxation, Any-All taxation is paid by you. You can send us your logo and team name, our 'Let Us Design' department will compose the banner for you. Free - No payment is due. Approval is not automatic. Our manager will review your request. Please describe clearly how and where your banner sign will be used. Use the contact us page and describe your team. 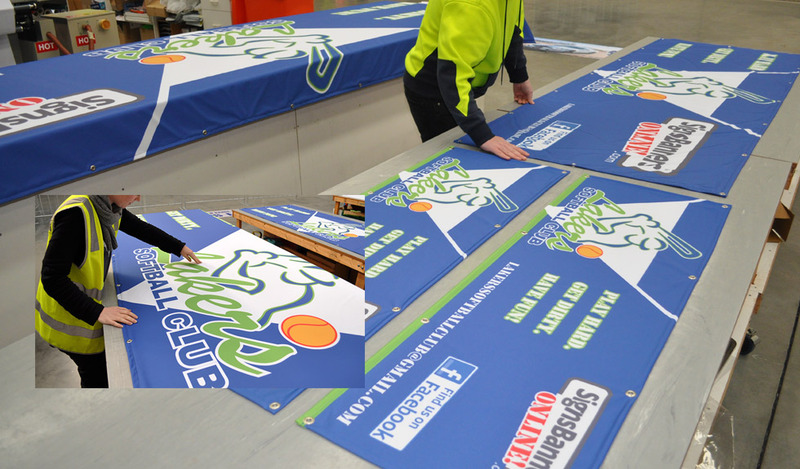 We will give you a banner sign with your club name and club logo free. You can have any size, big or small. 2/3 will be your area, 1/3 will be our logo. IMPORTANT We compose the file for you. After approval by our manager, we will ask you to send your team logo or club name and our design department will put it all together for you. IMPORTANT Sponsorship Approval is not automatic. We will consider ALL JUNIOR non-professional sports so please clearly describe the use of the banner sign. "We are very proud to support local teams and people promoting the participation of our youth, local communities and those helping develop strong bodies, minds and a sense of team work." 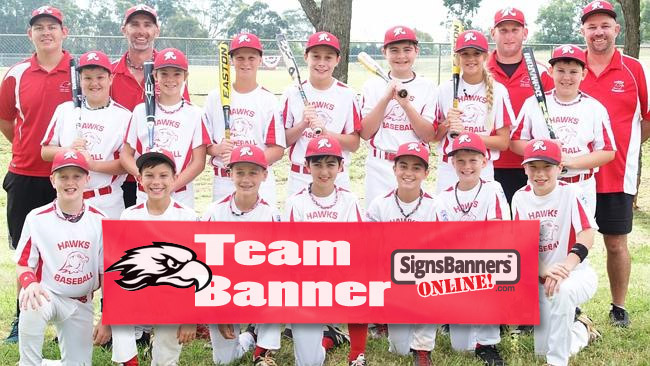 "If you are a committee member or parent let us know about your team/club and we can design print sew grommet and ship your custom team banner for you free." "We will put your club logo on it, words, team slogans and any other team graphic." Sponsorship banner prints also include free ship out. When you contact us, please provide an overview of your club or team. Include a website or social media link so we may visit you too. How it wil be used? How often it wil be seen? Team website or social media page? Suitable for Any Size: Football Baseball Basketball team banners Soccer Taekwondo Dance Sport teams, Cheer, Event and Championship team banner. Lacrosse, Hockey, Tennis, Track n Field and National. We also provide for smaller team sports such as Dance Sports (Cheer and Spirit) Disc Sports and Beach. S B O are happy to assist you with helping your local community youth leagues and developing participation of our young adults and teens. If your request shows that people can join in and have fun we will assist too! 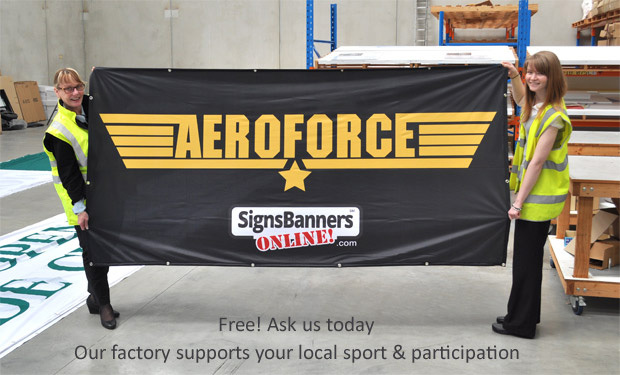 Ask us now for team sport sponsorship with a team banner. 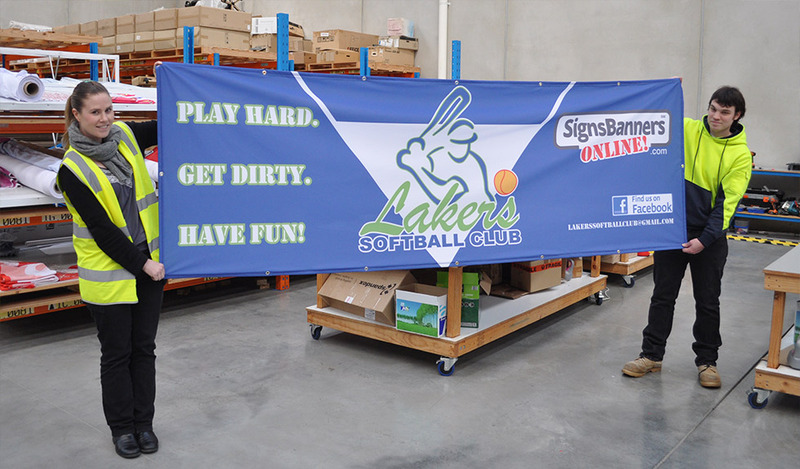 Signs Banners Online factory supports teams and clubs providing them with free team banners they can use to promote the participation and involvement of juniors and young adults participating in a club environment as a player, assistant and welcoming a sense of community spirit, pride and friendship. 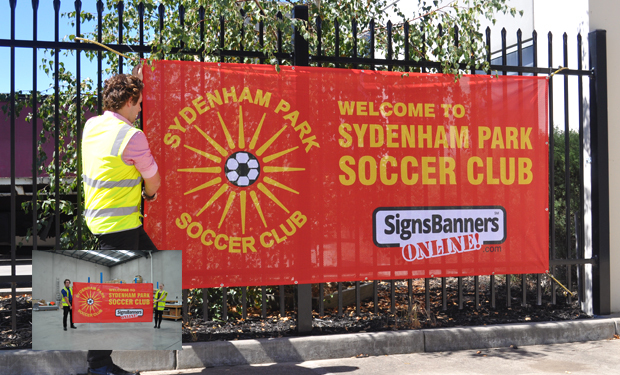 They offer any size printed banner or sign for the club or group with a no discrimination attitude to give every child an opportunity to be included. Well done Signs Banners Online for providing a free service for local communities throughout our nation. Thank you so very much to Signs and Banners Online for our awesome team banner which now hangs proudly in our rink. From the design process to the product arriving at my door, everything was flawless. The communication was great even when I needed a few changes made. The changes were made quickly and accurately. 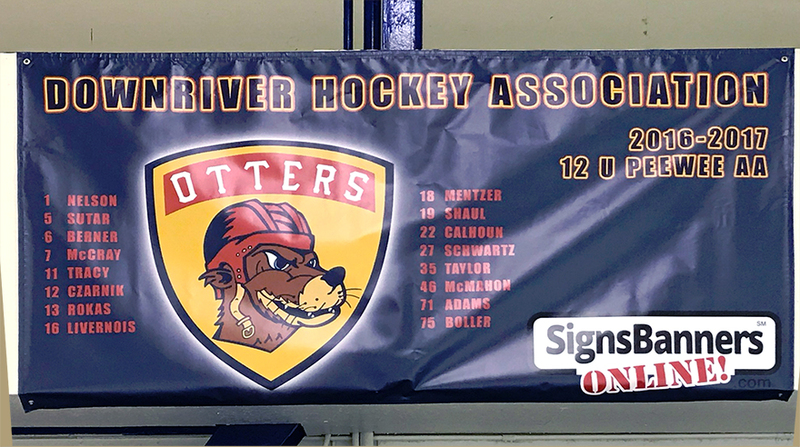 Thanks again from the Downriver Hockey Association and the 12U Downriver Otters Red Team. You guys rock! If you have many different teams or tournaments your grades attend we may supply a few extra... they'll want to be in the photo too... hooray!